Nailing The American Dream, With Polish The idea of an "affordable manicure" was once an oxymoron. That's before Vietnamese immigrants arrived in the U.S. and cornered the market for inexpensive nail-care salons. 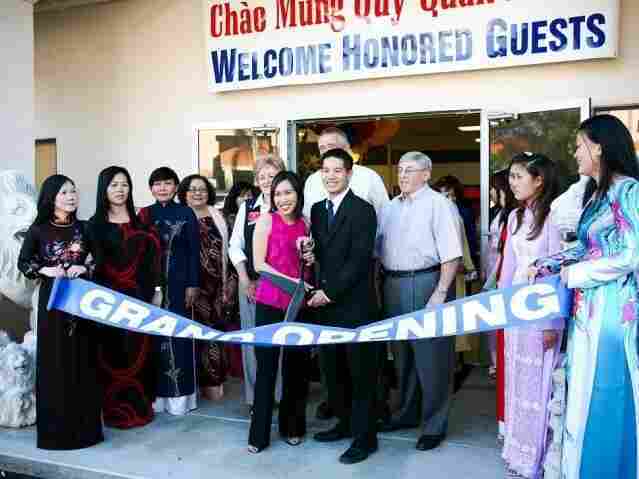 The industry has offered a path to self-sufficiency for many Vietnamese-Americans in California and around the nation. This NPR special series explores the state of the American Dream today. Tam Nguyen (center right) and his sister Linh run the Advance Beauty College in Garden Grove, Calif. If you've had a manicure in California, odds are the person at the other end of the emery board was of Vietnamese heritage. Vietnamese immigrants now dominate California's nail-care industry — and make up a significant percentage of all manicurists nationwide. The story began with a hurried immigration after the fall of Saigon almost four decades ago. Sparked by the interest of a group of refugees and the help of a Hollywood star, the demand for affordable manicures quickly became the foundation of the American dream for many Vietnamese newcomers. It's graduation day at the Advance Beauty College in Garden Grove, Calif., and staff are quickly bundling piles of flowers into small bouquets for each graduate. About an hour's drive south of Los Angeles, Garden Grove is part of what's known as "Little Saigon" — a segment of Orange County that has one of the country's largest Vietnamese populations. Tam Nguyen, the school's co-owner, proudly gives visitors a tour of the training floor. It's filled with dozens of young women chattering away in Vietnamese as they work on clients' hair and nails. Those customers come in for discounted services, enabling students to pile up the hours of practice required to receive their licenses. ABC also teaches cosmetology and massage, but Nguyen says most of ABC's students are studying manicuring. According to the industry magazine Nails, Vietnamese now make up 80 percent of the California's licensed manicurists, and about 45 percent of manicurists nationwide. A model shows off an ABC student's work. Most of the students are studying manicuring. "Our school is unique in that we offer a large manicuring program," Nguyen says. "Most private beauty colleges don't have one, just because, from an owner's perspective, the margins don't make sense." Instead, Nguyen says, most schools prefer to fill their slots with cosmetology students, whose tuition is significantly higher. Nguyen says his school, one of the biggest in the state, has become well-known among Vietnamese immigrants because it is designed to get them into the job market as quickly as possible — no English required. "We're one of the few schools in the country that actually teaches this in-language," Nguyen says. "All of our manicuring instructors actually are bilingual, with Vietnamese as well as English." Nguyen is the second generation in his family to run ABC. His parents, Diem and Kien, fled Vietnam, where Diem had been a navy commander, after the fall of Saigon in 1975. When the family immigrated to the U.S., Diem reconnected with friends who had begun to make money as manicurists. He saw they were able to work for themselves with little capital outlay. Alfred Osborne, senior associate dean at the University of California, Los Angeles' Anderson School of Business, says the Nguyens are typical of ambitious new immigrants. Affordable nail care, Osborne said, was a niche just waiting to be identified — and captured. "The Vietnamese just happened to be the immigrant group that was willing to do anything, that was new to this country," Osborne says. 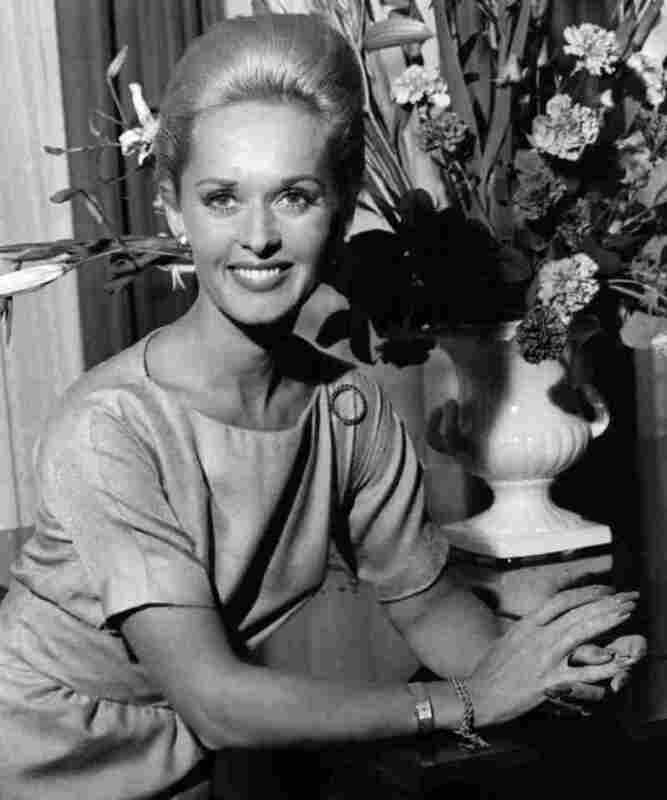 Actress Tippi Hedren was instrumental in helping Vietnamese immigrants to California get started in the nail industry. "And the suggestion for them to see this niche actually came from a Hollywood actress." That actress was Tippi Hedren, an elegant blond who starred in several of Alfred Hitchcock's movies in the 1960s. When she wasn't onscreen, Hedren was an international relief coordinator with the organization Food for the Hungry. After Saigon fell, she was working with Vietnamese women in a refugee camp near Sacramento when several admired her long, glossy nails. Hedren had a manicurist named Dusty at the time and asked her if she would come to the camp to meet with the women. Dusty agreed, and Hedren flew her up to Camp Hope every weekend to teach nail technology to 20 eager women. One of Dusty's students, Thuan Le, remains an in-demand manicurist at a posh salon in Los Angeles' wealthy Brentwood neighborhood. Le remembers Hedren insisting the new students learn the then-cutting-edge technique of silk nail wrapping, which created long, natural-looking artificial nails. "[Hedren] said, 'I trained you to become a very special manicurist, not just plain manicurist ... because you make more money,' " Le recalls. Thanks to Hedren's sponsorship, Le became licensed and immediately employable. Fortunately, she landed a job at a critical time, when her husband, a former fighter pilot, was looking for work and the family desperately needed money. Today, the family is financially secure. "I feel comfortable with my job, with the money I bring in to help my husband raise the children and the family," Le says. Le and her sister manicurists have transformed the nail business, which is projected to pull in some $7.3 billion this year. Today, affordable manicures have become so synonymous with the Vietnamese that Nails magazine offers a Vietnamese-language version. Le says the constant demand for affordable manicures has given a steady stream of Vietnamese nail technicians work across the country — and the globe. Even, ironically, back in Vietnam. "If you look around, you see they go everywhere — and they start from California!" Le says, laughing. And it's not just manicuring: Vietnamese merchants now supply a significant amount of materials and equipment for the industry. For instance, the largest global manufacturer of cuticle nippers is — you guessed it — Vietnamese. Le was a close friend of ABC founders Diem and Kien Nguyen, and the three reconnected in California. The Nguyens were inspired to get their own nail licenses after seeing how Le was able to support herself. Their successful school is the culmination of their dream. But Tam Nguyen says his mother's dreams went beyond economic self-sufficiency. "Their American dream was for their son to be a physician and to bring honor, prestige and a great living," Tam says. Being a dutiful child, Tam went to medical school. But on graduation day, Nguyen handed his diploma to his parents and told them being a M.D. was their dream — and running their beauty college was his. Looking back on that moment, Kien Nguyen winces. "Well, yeah, of course most Vietnamese families, they want their kid to be a doctor, a lawyer, you know?" she says. "So, we are the same, we have only one son." But that son made his parents proud a different way, by training thousands of women to earn their own living. He also added an M.B.A. to his resume, a degree he puts to use running the business. Back at the graduation ceremony, Tam is addressing the ABC graduates. "As you know, my sister Linh and I are second-generation owners at the beauty college," Tam tells the group. "We've graduated over 25,000 over the years, and it always makes us very happy to see our graduates go on and become successful." Names are called, one by one, and finally, when all the diplomas are conferred, the students gather for the traditional hat toss. Their journey to their individual American dreams has started.